They look alike, sound alike, and are often mistaken for each other, but quinoa and couscous are very different indeed. Couscous is a small, granular pasta made of semolina flour and it contains gluten. Quinoa is actually a small seed that is cooked and eaten in a similar manner to most grains but is gluten-free and relatively high in protein. Quinoa is the seed of the goosefoot plant that is related to spinach. It was cultivated for centuries in South America before the colonization of the Americas. The Incans called it "the mother of all grains." It can be considered a whole grain even though it's not a true grain. Quinoa is relatively high in protein and fiber compared to pasta. One cup of cooked quinoa contains 39.4 grams of carbohydrates, 8.14 grams of protein, 3.4 grams of fat, 5 grams of fiber, and 222 calories. It also provides iron and magnesium. It contains all nine essential amino acids, making it a complete protein and a welcome source of protein in a vegetarian diet. 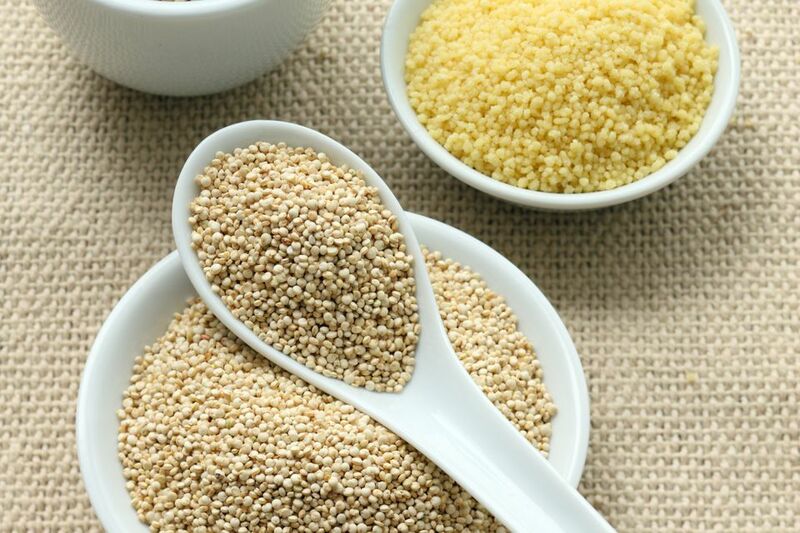 Quinoa is naturally gluten-free and has been shown in studies to be safe for people diagnosed with celiac disease. It is important for those who have gluten sensitivity to choose products that are labeled gluten-free and are not at risk of cross-contamination in facilities that also process wheat and other gluten-containing ingredients. Quinoa cooks faster than rice and many whole grains, in just 10 to 15 minutes. It can be used as a breakfast cereal or in place of rice or pasta in many dishes. Couscous, composed of semolina wheat flour, is the national dish of Morocco and has been a staple in North Africa for centuries. From ancient times, it was made by hand by rolling semolina and water until it forms tiny pellets, which were then dried. It is generally steamed or cooked like rice in a rice cooker. Because couscous is made of wheat, it contains gluten and should not be eaten by those who are sensitive to gluten. In fact, semolina is a high-gluten flour made from hard durum wheat. A cup of couscous contains 36 grams of carbohydrates, 2.2 grams of fiber, 6 grams of protein, 0.3 grams of fat, and 176 calories. As such, it is lower in fat and calories than quinoa, but also lower in protein, iron, and magnesium. Couscous is used in many ways that rice would be used, especially as a pilaf. It can also be enjoyed as a breakfast cereal, in salads, and as the base of many Middle Eastern dishes. Israeli couscous has slightly larger balls of pasta but is not as large as pastina. Both quinoa and couscous are small-grained and have a slightly nutty flavor. You might try swapping one for the other in a recipe, although the cooking directions need to be modified for the choice.